Ford Explorer and BBR Saatchi & Saatchi, Israel just made it easy to interact with print ads i.e. without an app! For the new SUV, they created a series of 3 interactive print ads which give visual demonstrations of the main features in sync with the creative look and feel. Ford definitely recognizes the need to innovate and use new methods to reach out to the prospects. Considering how fast the technology is growing and being adapted by the users, it is about time that we start seeing more of such ads. IKEA Russia and ad agency Instinct together exploited the basic features of Instagram to create the first Instagram Website. The marketing campaign for the ‘PS 2014 Collection’ included an interactive catalog on Instagram divided into Benches, Tables, Storage, Light, Textiles and Ideas. Each image shows a collection of items with a call-to-action to tap on the image. On tapping, we see the respective product in the range. Each product has its own channel that shows ways to use it and also includes a short video clip with English and Russian translations. It is such a simple experiment that I am surprise no one thought of doing it yet. Examples like these show how we get so involved in the daily usage and excitement that we forget to go beyond the boundaries and find more interesting ways of using it. It will be refreshing to see more examples like these from brands like Oreo, Coca-Cola, Red Bull and Nike – who have established themselves in their respective categories and own certain emotional triggers to engage their fans online. Check out the Instagram website http://instagram.com/ikea_ps_2014 and don’t forget to spread the word. Of course HBO did this. Of course they chose the right partner to do this as well – 360i. #TakeTheThrone is the hashtag for the latest Season 4 of Game of Thrones on HBO. With its agency 360i, HBO launched a website where all the conversations online on key networks Facebook, Twitter and Instagram featured with the #TakeTheThrone transforms into a digital throne. More than 6 million people watched the fourth-season premiere and tweeted enough to make this beautiful digital throne which animates into a throne of 1000’s of ‘word’ swords in this case. The website is quite heavy since it is loaded up with so much content and every click on the sword displays content based on what network is selected on the footer i.e. Twitter, Facebook or Instagram. Viewers can further share this content on social networks and also add their own content featuring the #TakeTheThrones to add more swords to the throne 😉 Participants can also win a trip to San Diego in July to get a chance to sit on ‘The Real Iron Throne’ at Comic-Con. It is a brilliant and simple idea to use the hype and content online and reflect it in such an interactive way featuring the main hero of the show – THE THRONE. Wonderful ad by Pepsi as a part of their ‘Unbelievable’ Campaign running in the UK. Beautiful video by Lexus. Using state of the art motion capture camera technology, advanced movement algorithms and bespoke motion mapping software, the Lexus quadrotors were brought to life and Amazing in Motion created. And an even smarter Tumblr page showing off lots of beautiful work and captures. Why I respect Audi for their recent efforts. A deep thought based on my own experience and that of my close friends in the advertising and digital industry makes me want to clap and declare Hans Thurner and Floris Dreesman the two men our industry needs to thank today. Rather than criticizing the Audi City experiment. Audi understands what digital means. So what is digital? Let’s keep this one short. Digital marketing is using electronic devices to engage with customers. Fact is that many brands just stopped here and are still learning to create presentations to educate their co-workers on what is digital. Just look closely, we are surrounded by digital. Everything has gone digital. Digital is not just online. TV is digital (Shazam TV tags, GetGlue and Viggle). Print is digital (QR codes, Blippar and AR tags). Experiential is digital and Audi has landed there with a crown. Audi is able to connect to their target audience by investing in online and offline experiences that are meaningful, fun and provide a benefit. Sometimes even just fun to have a good time and participate in love for cars. Cool cars. It somehow says ….I will not bore you with a lead management link to tell you to go online. You will do it because this film is so bloody awesome that even if you don’t like cars, the sound of this will make you want to talk about it, share it and read more about it. On scanning this ad with Blippar, you see this beautiful film, a sneak peak at what this beast is up to roaring away in madness. 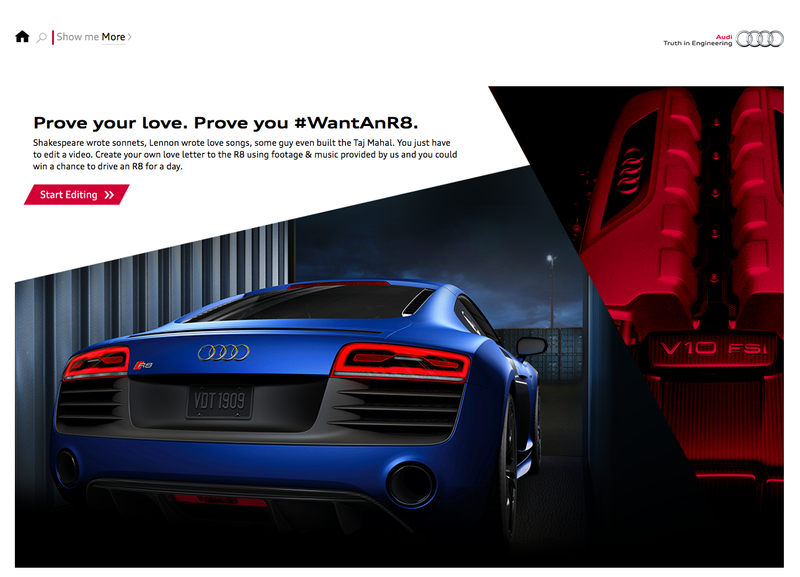 #WantAnR8 contest is the third one by Audi and this time on Tumblr because they wanted to turn up the game here. Their target audience are getting smarter, using sophisticated technology and becoming natural at participating in initiatives online. A really clever move here to move away from the norms like Facebook and Twitter and use the Tumblr’s freedom of theme & functionality to create a fun filled online experience. 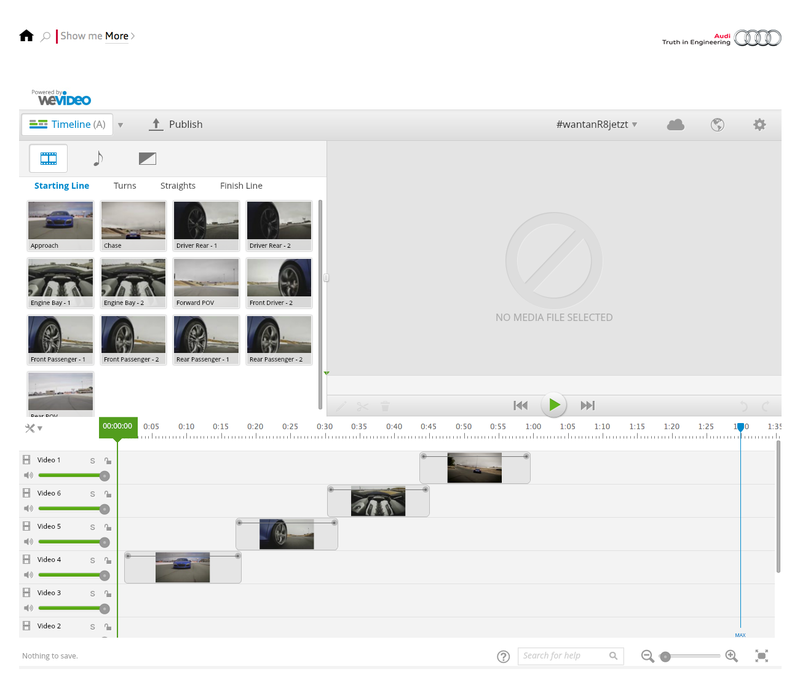 Audi offer about 40 short clips and 10 audio effects to let users create their own Audi R8 story. This video is then hosted on their YouTube page to house user-generated content. It just does not stop here. A part of this exercise is also to learn what a majority of customers prefer, what angles they like to see in videos and what sort of audio energy is desired. Audi has not used any paid media to push the campaign and generated about 100 submissions in just first 5 hours of launch followed by 200 in the first 4 days. Not bad at all for an organic growth. I must say I spent about 40 minutes trying to create an awesome clip and absolutely enjoyed every little part of it. 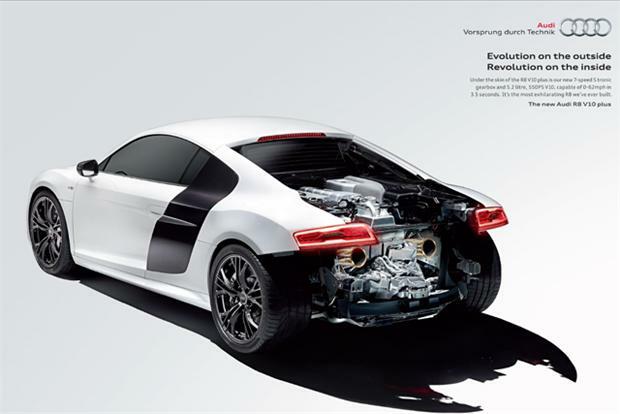 Audi did not push me in the end to rush me to their site and try to sell any other models, if not the R8. I was intrigued enough to swim around for some information on V10 and just read up. But if I were to buy in the near future a V10 beast, I will remember to check Audi out and recommend it to interested sports car buyers. Audi has extended the success of the A1 eKurzinfo app to A3 models. The A3 app helps the drivers to learn more about their car via visualizations rather than boring A3 bible manuals! It provides them instant access to detailed step by step information on how to complete particular tasks. e.g. how to locate the engine coolant. This is definitely useful for the first-time buyers who have poor knowledge on technical topics that are good to know about their car. Of course, there are inductions held to understand your own vehicle but we forget these over time and instant access available to such data is reassuring. The app recognises more than 300 elements of A3 and reflects all the data saved in cloud-based architecture. It is currently available in English, German and Japanese on the Apple Store. That was the customer service going digital. Online. Now what about offline. Here they have shaken things up with Audi City Showroom. The first virtual showroom without any cars. I have already blogged about it when they launched it but was lucky enough to visit RTT Excite 2013 in Munich where I was delighted to attend the presentation by Hans Thurner and Floris Dreesman on Audi City. Why I respect Audi so much today? Well 200 people at Audi and 70 of their partner agencies have been sweating it out to change the automotive buying behaviour. While still producing their online banners and Facebook applications that some think are digital gods of this online space, Audi is investing time and efforts to change all that you think you know about selling cars online or offline. They are capturing the whole universe around it making customers dependable on them and these new technologies making yours redundant in the next 2 years. Today you are developing dealer tool kits killing trees printing massive old skool stuff, Audi and even BMW are using digital to sort data and virtualise all that jazz on a sheet of paper, making it come alive and hit your senses. Tablets are the future. I fail to grasp how automotive employees criticize a concept like Audi City. The frustration of our generation is about following old school rules coming in the way of doing what our generation wants to see, wants to be and wants to show. We want to create it because we want to use that. Remember what Ferdinand Porsche said I couldn’t find the sports car of my dreams, so I built it myself.